Yokogawa Electric Corporation (TOKYO: 6841) announces that it has developed an N-IO standard field enclosure and a control system virtualization platform. The enclosure is a weatherproof remote IO cabinet that stores IO devices used by the CENTUM® VP integrated production control system and the ProSafe®-RS safety instrumented system, and the virtualization platform enables the control of multiple virtual devices on a single server. By reducing the amount of time and effort to engineer a new system, these solutions help to both speed up project execution and reduce total cost of ownership (TCO). The N-IO standard field enclosure is scheduled to be released in February 2018, and the virtualization platform will be released in May 2018. As global competition intensifies and the market environment changes, manufacturers want to set up production facilities even more quickly. Yokogawa is responding to this need using the agile project execution concept that improves agility. Agile project execution is an innovative approach to utilizing standardized technology and flexible project execution processes that keep automation off the critical path during project execution. The result is a lower cost of installation and maintenance, and the lowest TCO, while reducing the risks of project execution and delivery. For improved agility in project execution, Yokogawa developed the N-IO (Network IO) field IO device for CENTUM VP R6.01 (released in November 2014) and ProSafe-RS R4.01.00 (released in October 2015). Equipped with a module that can handle multiple IO signal types, the N-IO device can handle both analog and digital IO signals, which account for the majority of IO signal traffic. With this device, the signal type for each IO point can be configured solely through software settings. This eliminates the need to replace IO modules and wiring when changing sensor types and wiring layouts during engineering, and when changing sensor types during a plant revamp. This significantly reduces workload and speeds up project implementation. To realize the agile project execution concept Yokogawa has now developed the N-IO standard field enclosure and a control system virtualization platform. The enclosure is a remote IO cabinet that stores the N-IO device, a key component of the CENTUM VP and ProSafe-RS systems, and the virtualization platform enables the operation of multiple virtual machines on a single server. Together with its N-IO and Automation Design Suite (AD suite) integrated engineering environment*, Yokogawa uses virtualization technology to reduce plant construction costs and speed up project implementation. This helps to eliminate the risk of project delays and ensure on-time delivery. 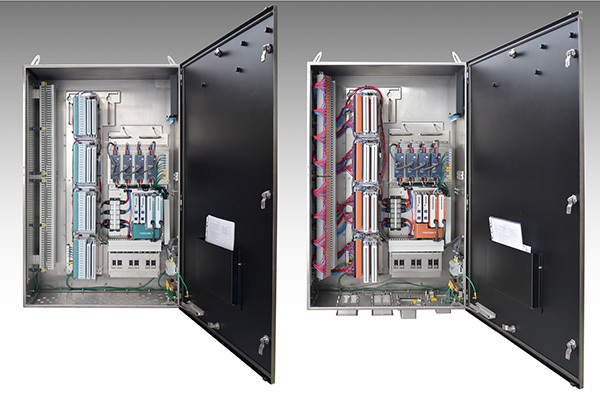 Many conventional cabinets for storing IO devices are designed to be installed in air-conditioned instrumentation rooms. For outdoor use, it is necessary to design special dustproof and water resistant cabinets. The N-IO standard field enclosure developed for the CENTUM VP and ProSafe-RS systems is a dustproof and water resistant remote IO cabinet that can be installed outdoors. By allowing the configuration of signal types through software settings, this enclosure eliminates the need for further design modifications. As such, it can be delivered directly to customers without further modification, for faster project implementation. Multiple PCs for operation, monitoring, and other purposes are typically used when configuring a control system, and the cost of procuring and maintaining these computers is substantial. 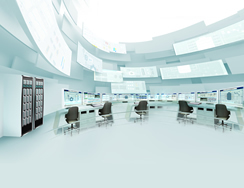 Yokogawa's control system virtualization platform enables a single server to perform the work of multiple virtual PCs, thus reducing the number of PCs required to configure a control system. With this platform, both the hardware and software required to build a virtual environment are provided. By means of this virtualized server environment, it is possible to separately update and make modifications to hardware and software as required. In preparation for system installation, Yokogawa carries out the engineering and conducts the factory acceptance test (FAT) of the software on a machine different from the one that will be actually used. Yokogawa delivers the hardware directly to the customer, and then installs the completed software. This speeds up implementation and prevents project delays. Oil and gas, petrochemicals, chemicals, electric power, pulp and paper, pharmaceuticals, food, iron and steel, water supply and wastewater treatment, non-ferrous metals, metal, cement, etc. Yokogawa released its CENTUM distributed control system (DCS) in 1975, a world first. CENTUM VP is the ninth generation in the CENTUM series. Known for their rugged performance, CENTUM systems set high standards for engineering and technology excellence while ensuring backwards compatibility with previous system versions and support of the latest technology applications. Knowledge-driven engineering lies at the heart of CENTUM, a Yokogawa flagship product that has been proudly serving the process industry, over the past 40+ years. Released in February 2005, the ProSafe-RS safety instrumented system helps prevent accidents by detecting abnormal conditions in plant operations and initiating emergency actions such as a plant shutdown. An independent certification body has certified that ProSafe-RS conforms to the IEC61508 international safety standard and can be used in SIL3 applications. Unlike conventional safety instrumented systems and distributed control systems, which are regarded as having different roles and functions and operate separately, the operation of ProSafe-RS and the CENTUM integrated control system can be fully integrated. * An engineering environment that Yokogawa has developed by leveraging engineering know-how accumulated in many projects. AD suite modularizes control applications and enables them to be used in similar facilities, increasing the efficiency of engineering and ensuring consistent quality.